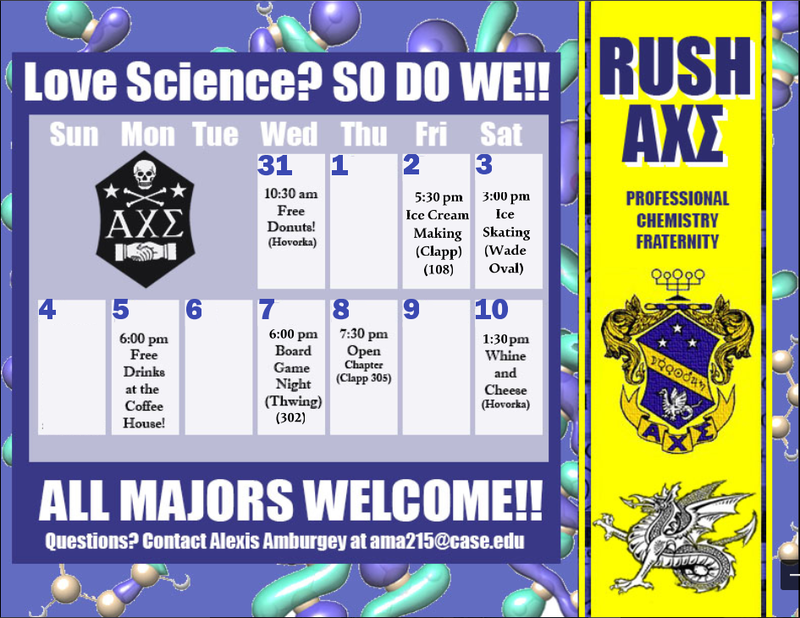 Each semester, Alpha Chi Sigma holds rush events for those interested in joining. These are generally during the third and fourth week of classes. We are co-ed, accept all majors, and those who are also involved in social Greek life. To be considered an "active" brother, one must pay dues each semester, as well as a one-time fee of $185 sent to Nationals when you join. (Dues are currently $20/semester and go mostly to future rush events.) We do not discriminate on the basis of gender, race, ethnicity, or creed. The rush calendar for Fall 2016 is shown below (for September to October). Contact our Vice Master Alchemist (information on "Contact Us" page) with any questions about rushing or pledging. Contact our Reporter or Vice Master Alchemist (information on "Contact Us" page) if you are interested in joining. ​Graduate students are initiated and inducted at the same time as undergraduate brothers. Our rush calendars are updated two weeks to a week before our rush begins. You can also look at our Facebook page to find the Rush Calendar or updates. After the rush period, the brothers will extend invitations to pledge the Fraternity based on a variety of factors, including: an interest in chemistry or a related science, availability to attend weekly meetings each Thursday evening, and an overall positive attitude toward the brothers and the other people rushing. Pledging lasts for the duration of the semester during which time period you’ll get to know your fellow pledge class and your soon-to-be-brothers.